About the book: Religious Celebrations, ed. J. Gordon Melton, with James A. Beverley, Christopher Buck, and Constance A. Jones, covers more than 800 celebratory occasions from all of the world's major religious communities as well as many of the minor faith traditions. The two-volume encyclopedia provides a complete reference tool for examining the myriad ways people celebrate their religious lives across religious boundaries, providing information on numerous celebratory activities. 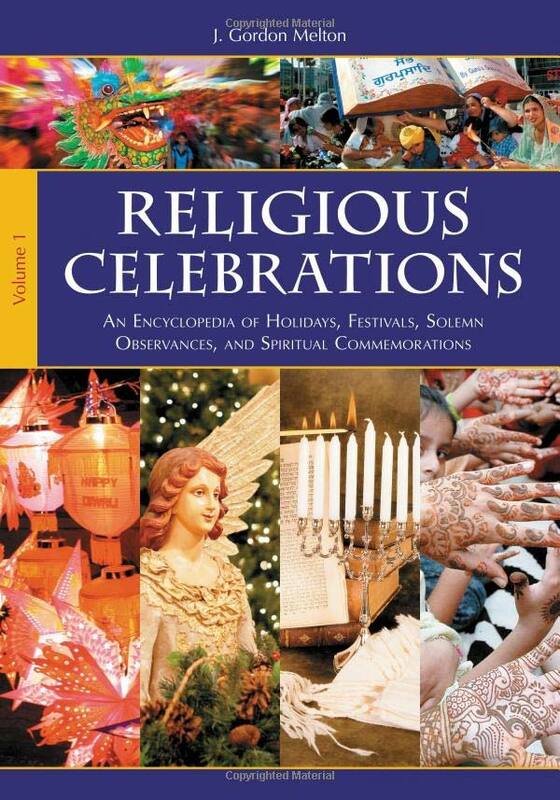 Offering the most comprehensive coverage of religious holidays ever assembled, this book covers festivals, commemorations, holidays, and annual religious gatherings all over the world. Entries written by specialists on different religious communities capture the unique intensity of each event, be it fasting or feasting, frenzied activity or the universal cessation of work, a huge gathering of the faithful en masse or a small family-centered event. The work spotlights celebrations that currently exist without overlooking now-abandoned celebrations that still impact the modern world. Order it online from the publisher or amazon. See also ABC-CLIO ebooks.